How to Snap Video Clips and Snap Image from Blu-Ray Disc? In order to snap video clip, you need to use a third-party video snapping program. There are many video snapping programs on the market, such as Final Cut Pro, iMovie, Premiere Pro CS6, etc, but many of which is relatively difficult to operate, and sometimes may be time-consuming to snap video clips that you want. More importantly, if you want to snap videos from Blu-ray disc, these video snapping programs mentioned above are inappropriate as they don’t accept Blu-ray format input. Therefore, it is necessary for you to choose a professional video snapping program that is able to snap video clips from Blu-ray disc. Have no idea what to choose? The post offers you an easy yet good solution to snap video clips from Blu-ray disc. In the following tutorial guide, we take Leawo Blu-ray Ripper Windows version as an example to show you how to snap video clips from Blu-ray disc. As the user interface of Leawo Blu-ray Ripper Mac version (Leawo Blu-ray Ripper for Mac) is the same as that of Leawo Blu-ray Ripper Windows version. Mac users can get a glimpse from below. Launch Leawo Blu-ray Ripper, and click “Add Blu-ray/DVD” button on the sub-menu bar to load source Blu-ray disc or folders. Also, you could drag and drop source Blu-ray movies to the program. While loading, 3 loading ways are selectable: Full Movie, Main Movie and Custom Mode. Select desired one to load source Blu-ray movies. 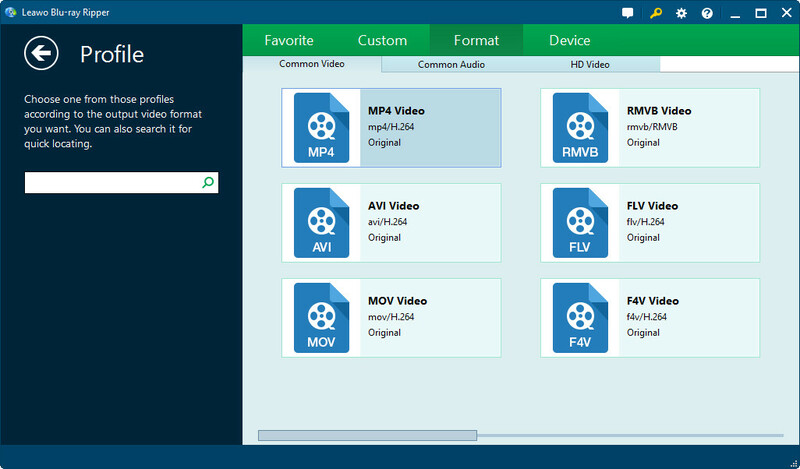 Select one file on the processing list panel, click the down-down box named “MP4 Video” by default (the button next to Add Blu-ray/DVD button), and click “Change” button to select a profile as output format. Moreover, you can click “Edit” button to adjust the parameters of selected profile, and if you need, click “Apply to all” button to set selected profile as output profile for all loaded files. When finishing output profile and detailed parameters setting, you will be returned to the main interface. At the end of each title for load files, you could see an “Edit” icon, by clicking which you could enter the video editing panel, where you could Trim video length, Watermark source videos, Crop video size, adjust video Effect, add 3D effect. 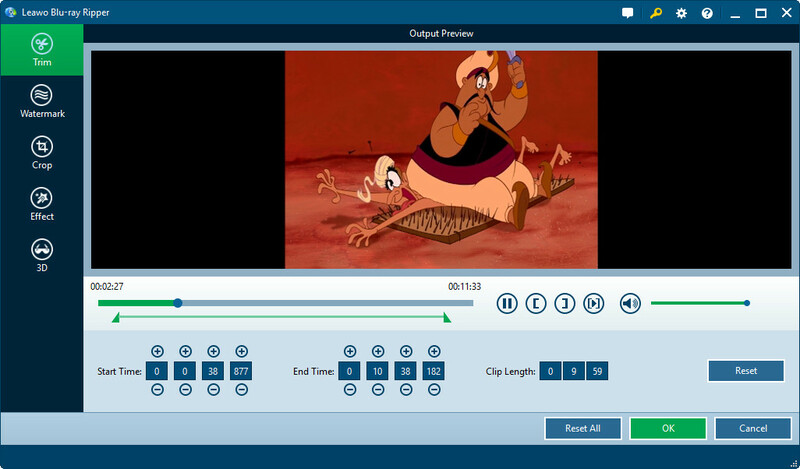 As you want to snap video clips, you should click “Trim” button on the left side of the video editing panel to enter the video snapping window. 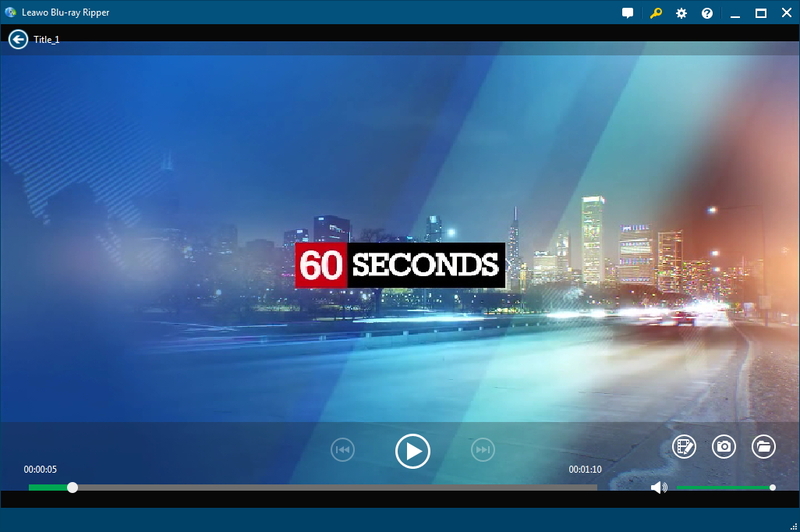 In the video snapping window, you can snap video clips by dragging and then positioning the limiters on the playbar, clicking the “Set as start time” and “Set as end time” buttons, or manually inputting millisecond time indexes at the bottom Start Time and End Time Boxes. After you finish snapping, you can see the total Clip Length. If you are unsatisfied with the cilp, you can click “Reset”, otherwise, you should click “OK” to save the video clip you snap. Once “OK” clicked, you are return to the main interface again, and you can repeat the process until you finish all your video clips snapping. On the main program interface, you could see a big green “Convert” button on the sub-menu bar. Click it to call out the converting setting panel, on which you need to set output directory and then click the “Convert” button to ouput video clips snapped from Blu-ray disc. After outputting, you can find the snapped video clips on the directory you set before. In addition to allowing users to snap videos from Blu-ray disc, equipped with an internal Blu-ray player, Leawo Blu-ray Ripper also allows users to snap image from Blu-ray disc. Once again, Leawo Blu-ray Ripper Windows vesrion is taken as an example to show you how to snap image from Blu-ray disc. Select one file on the processing list panel, and click “Play” icon at the left side of title selected to enter the internal Blu-ray player. You can click camera icon which represents “Screenshot” to snap image of Blu-ray movie. When finishing, you can click the icon next to the camera icon to open screenshots folder to get the image snapped. See? With Leawo Blu-ray Ripper in hand, it is very easy to snap videos and snap image from Blu-ray disc.